In Beijing I of course did the one thing you have to and climbed the Great Wall of China. Well, part of it. The Mutianyu part, to be specific. (Click here to see a map and guide to the different sections). The section I visited was a restored section rather than a ‘wild’ original one and was the second most popular. It’s about an hour and a half drive outside of Beijing and you can get there by public bus, tour coach or private car. To be honest, I was going to be cheap and get buses there but my short experience of Chinese public transport had terrified me, the internet gave me mixed information about which buses to get and to be honest, I wasn’t convinced I would get to the right place without speaking comprehensible Chinese. Instead, I played it safe and booked a tour with Urban Adventures. It was a lot more money than I really wanted to pay but for the assurance I would get to the Wall and back in one air-conditioned piece, I was willing to pay it. Plus you get a tour guide and entrance ticket included. The tour I went on was marketed as a small group tour in order to make it a better experience for everyone. It couldn’t have been a smaller group! I was the only person on the tour, apart from a Japanese man, Etsuo. With our guide Vivian, we set off at an eye-watering 7am. (I’d been up since 5am to get to our meeting point on time…). They say the earlier you go, the ‘more wall, less people’ experience you get. If you’re not sure what they mean, check out these kind of horrifying photos. I definitely did not want to be wading through sweaty crowds of people! When you get to the Wall’s location, you need to take a method of transport up onto the Wall itself. At Mutianyu, you can take the chair-lift or cable car up and either the toboggan or chair-lift down. Etsuo and I took the chair-lift and toboggan down. Boy was that fun. Vivian told us about one tourist couple who had previously visited the Great Wall but had come back again just to experience the toboggan! The people working there will also proudly tell you that Michelle Obama and her daughters tobogganed down when they visited. For the best value for money, take the chair-lift up and the toboggan down for 100 CNY. Once up on the Wall, Vivian told us some of the history, like where the guards slept, when the wall was built, the original international border and why there are two different colours of brick (Mutianyu is all restored but at two different times). The lovely Vivian then proceeded to become our personal photographer. See exhibits below. (They were all her ideas, not mine!). After our impromptu photo shoot, we were free to climb and wander as we liked. The starting point on the Mutianyu section is kind of in the middle. It’s split up into smaller sections, numbered according to the towers along the way. We started at tower 7 and if you climb up to tower 1, it’s a very steep climb but probably the best views of Mutianyu. Alternatively you can turn left at 6 and climb up to 21. It’s a really long way so I only made it as far as 11, I think. Whatever you choose, you need mountain goat legs. I spent the last 2 and a half years running up endless London Underground escalators in rush hour without breaking a sweat so I have thighs of steel but it was still ruddy hard work! Especially because it’s hot and the steps are paved very evenly. It’s definitely worth it though, although I wish it wasn’t as hazy when we went so we could have seem further out from the wall but it sounds like the haze is pretty common. I didn’t spend quite as long up on the wall as I should have done, partly because I think I have a short attention span (the Wall is lovely but once you’ve climbed a couple of kilometres, it all starts to look the same!) but also because I didn’t bring enough water with me. (You can buy water up there but the prices are extortionate). Once my legs had turned to jelly, I took the toboggan down to the bottom of the Wall. This was almost my favourite bit! (I did take a video but can’t upload it on WordPress). After we had finished climbing the wall, Vivian and our driver drove us to a local favourite restaurant and ordered some food for us. We had eggplant, kung po chicken and pork & smoked tofu. We also did a lot of chatting and comparing of our cultures. Etsuo is actually an economics writer for Tokyo’s biggest newspaper and he wanted to ask me lots of questions about the UK’s referendum on the EU, and was also interested in what I did when working for the Mayor of London. It’s not the first time someone in China has asked me similar questions! All I’m saying is Theresa May should have made me Foreign Secretary, not Boris… I’m a one woman-band promoting the UK here. A long chat later and stuffed with food, we made the hour and a half car journey back to central Beijing. Before we parted ways, Etsuo gave me his business card and said to let him know if I was ever in Tokyo (I’d told him earlier how much I love sushi J ). What a nice guy! If you go to the Great Wall, make sure you pick the best section for you. 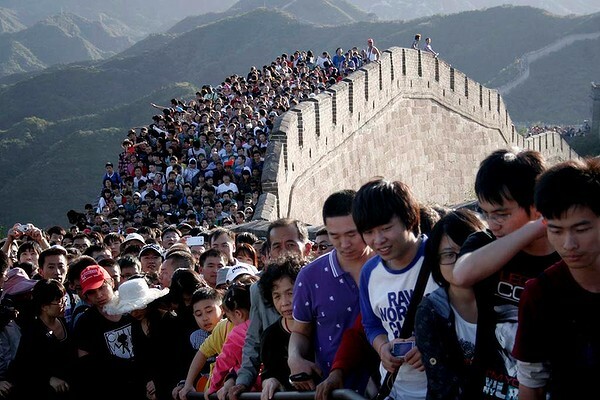 Some people don’t mind the crazy tourist numbers at Badaling because they want to go to the closest and easiest section to climb. Others are happy to travel further out and want to hike a wild section for its serenity and authenticity, or maybe because they really want a challenge. But here’s my mum moment: If choosing a wild section, be very careful! It’s remote and potentially dangerous as they are many loose stones and bricks. Also, there are ‘illegal’ sections of Wall which aren’t officially open to the public because they’re too dangerous but some tourists still get tricked into climbing them (or are just plain stupid and climb them despite knowing they’re illegal). I heard some horror stories from Vivian of some people getting injured and stuck on the wall for long periods of time because there was no one around…! Make sure you research ahead to find the best legal section. I recommend here is a good starting point. Also, decide whether you want to book a tour or brave it alone. For non-Chinese speakers, I definitely recommend a tour. Don’t be a cheapskate! I booked my tour with Urban Adventures but there are other organisations out there.